Shirzadegan, K., Gharahveysi, S., Irani, M. (2014). Investigation on Effects of Iranian Green Tea Powder in Diet on Blood Metabolites and Carcass Characteristics of Broiler Chicks Ross308. International Journal of Advanced Biological and Biomedical Research, 2(Issue 4 (2)), 31-39. K. Shirzadegan; SH. Gharahveysi; M. Irani. "Investigation on Effects of Iranian Green Tea Powder in Diet on Blood Metabolites and Carcass Characteristics of Broiler Chicks Ross308". 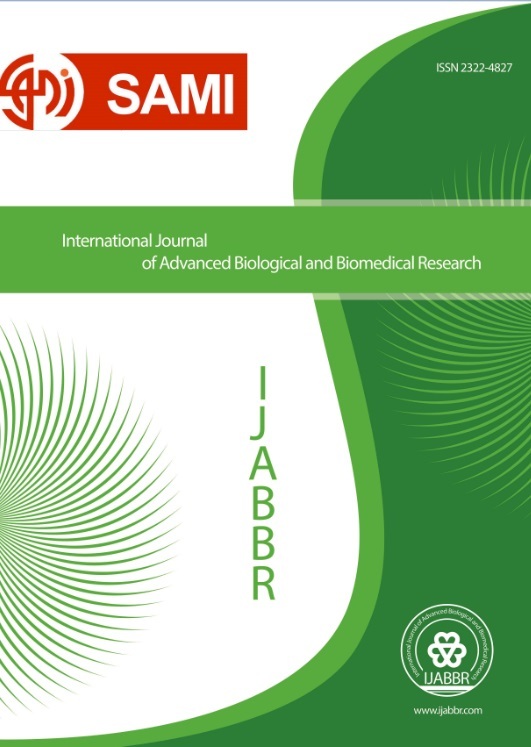 International Journal of Advanced Biological and Biomedical Research, 2, Issue 4 (2), 2014, 31-39. Shirzadegan, K., Gharahveysi, S., Irani, M. (2014). 'Investigation on Effects of Iranian Green Tea Powder in Diet on Blood Metabolites and Carcass Characteristics of Broiler Chicks Ross308', International Journal of Advanced Biological and Biomedical Research, 2(Issue 4 (2)), pp. 31-39. Shirzadegan, K., Gharahveysi, S., Irani, M. Investigation on Effects of Iranian Green Tea Powder in Diet on Blood Metabolites and Carcass Characteristics of Broiler Chicks Ross308. International Journal of Advanced Biological and Biomedical Research, 2014; 2(Issue 4 (2)): 31-39. A research was carried out so as to determine the effect of Iranian green tea (IGT) powder in diet on blood metabolites and carcass traits of broiler chickens. Therefore, considered four treatments consisting (basic diet + IGT 5g/kg feed, basic diet + IGT 10g/kg feed, basic diet + IGT 15g/kg feed and one control diet without additive), and three replicates (15 chicks per repeat). This study lasted 42 days. The data obtained were analyzed according to the complete randomized design model. The results this study was showed that effects of supplementation of diet with green tea were significant on cecum weight, TBARS, LDL and cholesterol of plasma (P<0.05). The highest LDL, HDL, TBARS and cholesterol were related to control groups, but, the highest and lowest cecum weight mean was related to 15g green tea and 10g green tea groups (P<0.05) respectively. However, the additives had no any significant effects on glucose, triglyceride (TG), HDL and other carcass traits (P>0.05). In conclusion, this experiment indicated that diets supplementation with Iranian green tea powder; have positive effects on carcass oxidation of broilers and it could be also helpful in decrease plasma LDL and cholesterol and reducing the cardiovascular diseases.